He slouched at the table, pencil in hand. But instead of working on his worksheet (yawn), he was looking at an tiny black ant crawling all the way across the windowsill…. 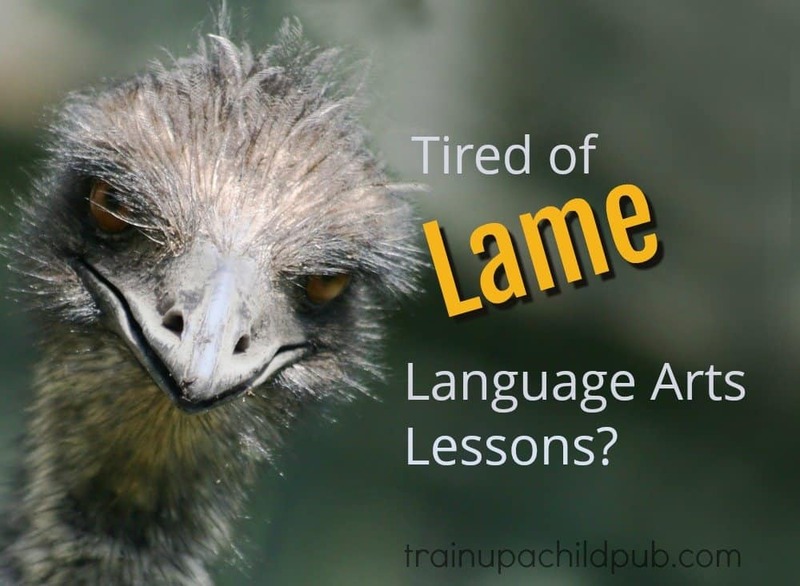 Are your students getting tired of lame language arts lessons? Then jolt them out of their terminal dreariness with this funny figurative language arts lesson plan! Part I: Teach or review the definitions of these three kinds of figurative language to your middle or high school student. Simile–a figure of speech comparing two things using the words “like” or “as”. Example: My love is like a red, red rose. This is the first line of a poem by Robert Burns, found here. Metaphor–a figure of speech comparing two unlike things. Example: The name of the Lord is a strong tower. Proverbs 18:10 What does the author want to tell you about the name of the Lord by comparing it to a strong tower? Analogy–a comparison between two things that are alike in some way. Example: Your body can be compared with a car and food to fuel. What other analogies can you think of (a heart is like a pump, etc.)? Instructions: After discussing the definitions, have your student state which two things are compared in each sentence. Then discuss whether each sentence uses a simile, metaphor, or analogy. If needed, have your student rewrite the sentence so that two things are compared with either a simile, metaphor, or an analogy. 10. From the attic came an unearthly howl. The whole scene had an eerie, surreal quality, like when you’re on vacation in another city and Jeopardy comes on at 7:00 p.m. instead of 7:30. 11. Her hair glistened in the rain like a nose hair after a sneeze. 12. Long separated by cruel fate, the star-crossed lovers raced across the grassy field toward each other like two freight trains, one having left Cleveland at 6:36 p.m. traveling at 55 mph, the other from Topeka at 4:19 p.m. at a speed of 35 mph. 13. They lived in a typical suburban neighborhood with picket fences that resembled [a movie star’s] teeth. 14. John and Mary had never met. They were like two hummingbirds who had also never met. 15. He fell for her like his heart was a mob informant, and she was the East River. 16. Even in his last years, Granddad had a mind like a steel trap, only one that had been left out so long, it had rusted shut. 18. The plan was simple, like my brother-in-law Phil. But unlike Phil, this plan just might work. 19. The young fighter had a hungry look, the kind you get from not eating for a while. 20. He was as lame as a duck. Not the metaphorical lame duck, either, but a real duck that was actually lame, maybe from stepping on a land mine or something. 21. The ballerina rose gracefully en pointe and extended one slender leg behind her, like a dog at a fire hydrant. 22. It was an American tradition, like fathers chasing kids around with power tools. 23. He was deeply in love. When she spoke, he thought he heard bells, as if she were a garbage truck backing up. Instructions: Extend the lesson by having your student rewrite the sentences using better comparisons. Make sure to have him include all three types of comparisons in his sentences. Have your student research Robert Burns, the poet mentioned in Part I. Then have her write a short report or create a PowerPoint or other presentation on his life and poetry. Find two other examples of his poetry, and identify similes, metaphors and analogies. Hope you enjoyed your writing lesson! Let us know how it turned out!